The silence of the night was broken by the cries of a baby entering the world. It is such a sweet sound. A sound that every new mother waits anxiously to hear and when the cry rings out, her heart is overwhelmed with joy. 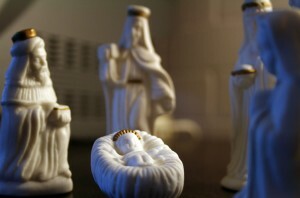 The cry on this starry night in Bethlehem so many years ago was no ordinary cry, and this child was no ordinary baby. This was the long awaited Messiah, the Saviour of the world. Emmanuel. This helpless babe that Mary held in her arms, and lay to sleep in a manger was Jesus. He was so small and seemingly fragile, with little fingers and toes, and squinting little eyes, and yet the Son who came that day was the Eternal Word. That precious child was God, given by the Father for the world He so loves. The joy that filled Mary’s heart as she looked upon her child should have been a joy that was shared by the entire world, “For to us a child is born, to us a son is given.” (Isaiah 9:6) This was one of the greatest moments in history and what we received through this young peasant girl, who was fully surrendered to God’s plan for her life, was the greatest gift ever to be given. As the shepherds followed the bright and shining star in search of their King, much of the world slept on totally unaware of the miracle that arrived in Bethlehem that night and oblivious to their total depravity and need to receive what God was so freely giving. What a miracle it was that the Son of God would leave the fullness of heaven to walk on the dusty roads of this earth, and even more incomprehensible that He would come in the form of man, in the form of a helpless babe. My sweet Jesus stepped down from His throne in heaven, a throne where the seraphim forever sing, “Holy, holy, holy!” and where He was and will continue to be eternally worshiped, to a place where He knew that ultimately, He would be scorned, beaten, and hung on a cross. Much of the world continues on in sleep even today with their minds darkened to the miracle of the Person of Christ, who when walking on this earth was fully God and fully human, making a way for us to be reconciled to the Father through the shedding of His blood. But for those who believe, as we look upon this babe sleeping in a stable, how are we to respond? What gift can we offer this Christmas Day to the Christ-child who is worthy of all our praise and more than everything we could possibly bring? Bowing down with my face to the ground in the hay at the side of the manger, offering all that I have, would hardly be a gift fit for my King, my Lord, and my God. No one could come with an offering valuable enough to be worthy of Son of God. What is a child of God to do, whose heart’s desire this Christmas is to bring an offering worthy of the one who saved us? The answer can be found in Philippians 2:5 where it tells us to have the mindset of Christ: Who, being in very nature God,did not consider equality with God something to be used to his own advantage; rather, He made himself nothing by taking the very nature of a servant,being made in human likeness. And being found in appearance as a man, He humbled Himself by becoming obedient to death even death on a cross! (Philippians 2:5-8) These words fill my heart with trembling, if having the mindset of Christ is what I am to strive for, but at the same time these words fill my heart with joy. That cry in the silent night of Bethlehem rang out that my Lord had come. That cry of a helpless babe was my Saviour humbling Himself to do for me what I could never do for myself, and that sweet child of Mary’s laying on the hay that first Christmas morn showed a lost world what love does. What could we possibly offer in return? We can offer Christ in us by humbly and obediently bowing down to our Servant King. We cannot consider ourselves, or even consider what we have to give, we can only take our place at the foot of the manger, at the foot of the cross, and lay down all of ourselves, so that our Lord and Master can work His mind and His plan into our lives. Only then will we have something to offer our King when we fall on our faces to worship Him. This is my Christmas offering to the only One who is worthy. Not myself, but Christ in me, to the One whose Name is above every Name. To the one who fills my heart with joy.